Vegetables Gardens Can Be Beautiful Too — Hilgersom Inc. Pick up landscape tips and learn about creating or caring for your yard with articles written by Jerry Hilgersom. Most people love the idea of having their own vegetable garden to enjoy the benefits of fresh produce in the summer. There are numerous limiting factors that may prevent someone from actually growing any veggies, one of which is the aesthetics of a vegetable garden. When it comes to finding a space in one’s yard for produce, initial thoughts are often to place it in a spot that is tucked away and not prominent in the landscape. After all, vegetable plots are often unsightly, right? They don’t have to be! There are different techniques you can use to make your garden space both productive and beautiful in your landscape. After all, vegetable plots are often unsightly, right? Probably the best way to make your boring vegetable garden look better is to utilize raised planters. They can be built from numerous different materials, but the most commonly used ones are wood, metal, and brick. Choose a building material that matches or compliments other landscape elements in your yard to gain a unified look. Not only will these raised planters define your garden space and look great doing it, they also have many other great benefits. Gardening becomes more enjoyable when you’re not always forced to hunch over or sit on your knees while stepping in the mud. You will also achieve a better planting medium, especially compared to the clay soil found in most yards in Lethbridge and surrounding areas. This better soil will promote root development and better drainage — both keys for happy plants. And happy plants equal more vegetable/fruit production which translates into happiness in the form of tasty food in your belly! Raised planters for your vegetable garden will also let you get an earlier start to the growing season as they help the soil temperature warm quicker. Lastly, those raised planters will help prevent small children and pets from inadvertently trampling your hard work! Another simple way to turn that dull vegetable garden into a landscape feature instead of a liability is to add companion plantings such as flowers and ornamental plants. We often view flowers as things of beauty. For plants, though, flowers are used to attract important pollinators such as bees and hummingbirds. Why not combine those two uses to create a beautiful vegetable garden while attracting those crucial pollinators to your fruits and vegetables? Some ornamental plants can also deter pests. For example, if you have problems with deer eating your produce before you have a chance, add marigolds around the garden perimeter and their pungent smell will guide them to your neighbour’s yard instead! By using other ornamental perennials and shrubs planted amongst your vegetable garden, you will also help give the garden plot year-round interest. For example, add an ornamental grass in a planter corner or a low hedge around the garden’s perimeter. Things like this will give you something to look at and enjoy in early spring and late fall right through winter when the vegetables are no longer the stars of the garden. Trellises, arbours, and garden obelisks are great ways to add both form and function to your vegetable garden space. Their support will guide your vegetables to grow vertically which will save valuable space in your plot of land, meaning more things can be grown in the same-size space. The vertical element that these garden structures provide also make your garden more interesting to look at while promoting more sunlight and airflow — things important for healthy plants and delicious produce. Also, think about adding statuary to your garden plots to, once again, provide year-round interest for your garden. Even useful items like rain barrels can become landscape features when done creatively! There’s no doubt about it, a vegetable garden does require some time on your part to maintain. Why not also add a sitting area in your garden plot so that you can sit back and enjoy the fruits of your labour (pun intended)? Whether it’s a patio complete with a harvest table, or a corner just large enough for a chair between your garden boxes, create an inviting spot where you can relax while sampling the tastes of summer. By taking a few simple steps, you can transform your boring, unsightly vegetable garden hidden away and occasionally ignored, into a beautiful space you’ll be proud of and want to spend time in. Can your lawn provide you with as much satisfaction? 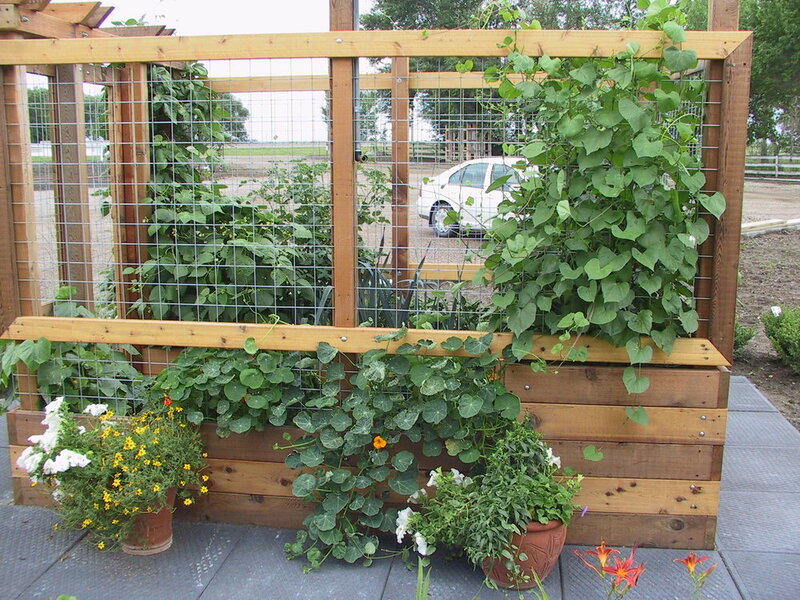 Consider installing a vegetable garden as a feature in your yard!